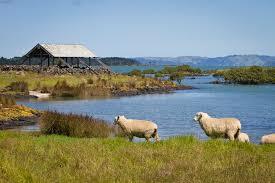 Ambury farm park lies among the southern suburbs fronting the Manukau Harbour. Take in the various farm animals as you wander around the open pasture. Ambury is a significant habitat for shorebirds and the coast has excellent examples of basalt lava flows. The farm animals at Ambury are family favourites. You will see sheep, goats, cows, pigs, pet lambs (in season), chickens, turkey, rabbits and our elusive peacock. Grassy lanes between the animal enclosures help you get up close to the animals safely.